Thanks to io9, we have confirmation that the original Teen Titans cartoon is making a comeback. 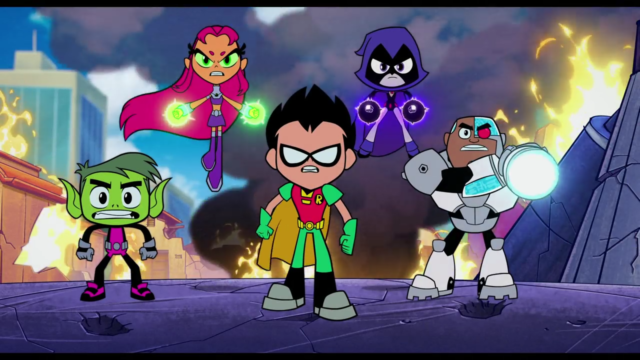 Earlier this week, a 30-second trailer began making the rounds online, presumed to be from next week’s Blu-ray release of Teen Titans Go! to The Movies. The clip teased an upcoming project called Teen Titans Go! vs. Teen Titans and expanded on the former film’s mid-credits scene. That scene showed the classic Titans transmitting a message declaring that they had “found a way back.” According to Warner Bros. Animation, the two manifestations of the superhero team will intersect in 2019. However, we don’t know if the crossover will be a TV special or a full-length movie. But with the new year right around the corner, we can probably expect more details to be announced very soon. The original Teen Titans cartoon aired on Cartoon Network for five seasons between 2003 and 2006. It had a very catchy J-pop theme song by Puffy AmiYumi, as well as a comedic approach to the source material. When the lineup was revamped for Teen Titans Go! in 2013, some fans complained that it relied far too heavily on a family-friendly aesthetic. Whether you love it or hate it, there’s no denying that the new series has enjoyed a pretty big year. Teen Titans Go! To the Movies was met with positive reviews from critics when it hit theaters this summer and it was recently submitted for consideration at next year’s Academy Awards ceremony. You can watch a teaser for the new crossover below. Are you excited for the classic Teen Titans series to make its triumphant return? Tell us what you think in the comment section!